LONDON--(BUSINESS WIRE)--The global organic edible oil market is expected to grow at an impressive CAGR of more than 11% during the forecast period, according to Technavio’s latest market research. In this market research report, Technavio covers the market outlook and growth prospects of the global organic edible oil market for 2017-2021. The market is further categorized into eight product segments, including organic soybean oil, organic olive oil, organic canola oil, organic palm oil, organic coconut oil, organic peanut oil, organic sunflower oil, and other organic oils. APAC accounted for close to 35% of the total market share in 2016, making it the largest region in the global edible oil market. Some of the popular organic oils among consumers are soybean oil, palm oil, canola oil, and sunflower oil. China and India contribute to the largest production of soybean and sunflower oil. The consumption of these oils is high because of their easy availability and low cost. The market is also witnessing a shift toward healthier varieties of edible oils to avoid the different health issues and chronic diseases. “The increasing awareness of the consumers about the impact of different oils on their health is promoting the use of safe and nutritious edible oils over traditional oils. The increasing incidences of oil adulteration and rise in disposable income are factors fueling the growth of the organic edible oil market in APAC,” says Manjunath Reddy, a lead food research expert from Technavio. In 2016, EMEA accounted for close to 34% of the total market share in the organic edible oil market. The demand for edible oil in the region is driven by the increasing focus on health and wellness. The purchasing behavior of consumers is directly affected by their consciousness towards the nutritional value of edible oils. Some of the most popular oils in the European market are palm oil, groundnut oil, coconut oil, soybean oil, and sesame oil. 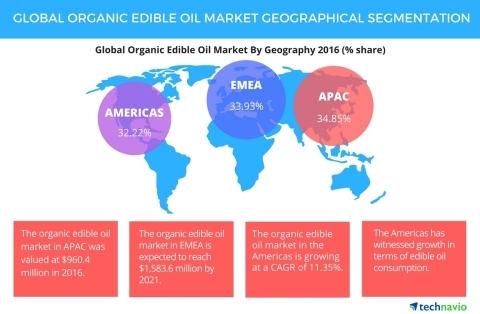 The significant change in consumers' purchasing power, health benefits, and the growing popularity of the organic oils segment will boost the demand for organic edible oil in the EMEA market. The popularity of soybean oil, canola oil, palm oil, and sunflower oil is propelling the consumption of organic oils in the Americas. The shifting demand towards healthier cooking oils owing to a rise in the percentage of health-conscious consumers will directly impact the sales of organic oils in this region. The consumers in the market are willing to pay a premium price for healthy and safe oils. Healthy oils, including canola oil and olive oil, are very popular in the American market. In 2016, the Americas occupied for around 31% of the total market share in the organic edible oil market. “The increase in urbanization, rise in disposable income, and change in lifestyles are driving the sales of organic edible oils in the Americas. The consumers are encouraged to buy organic oil certified by authorities such as the United States Department of Agriculture to avoid the risks of contamination of inorganic edible oils and other adulteration,” says Manjunath. The global organic edible oil market is expected to grow at an impressive CAGR of more than 11% during the forecast period, 2017-2021.